This past weekend, I had a sudden craving for coconut cake, inspired by a very old memory of coconut cakes from Goodwood Park hotel (anyone remember them, circa maybe 20 years ago?) It was also, I must admit, a result of having over-zealously purchased too much shredded coconut than I knew what to do with. Sadly, coconut cakes really seem to have gone out of style and it's hard to find a good one nowadays, one that is light rather than greasy and sweet rather than dessicated. It seemed the only solution was to turn to the cookbooks and even then, it was hard to find a recipe that was not overtly American. Luckily for me, my friend PL enthusiastically took up the cause, even sending me a copy of a recipe from her book, Breads with Amy. She felt the recipe looked the most likely to yield a moist and fluffy cake. I read it through it and the combination of cake and frosting seemed really involved but I was resolved that I had to do it properly, so off to the grocery I went for all the ingredients I didn't already have. The recipe, upon closer reading, was really for a custard-like frosting, into which you whipped cream, to make it light and fluffy. Since the frosting had to be made the day before, I gamely opened up the cans of coconut milk and began to boil, stir and thicken the custard, then I added the cream cheese and vanilla bean but left out the white chocolate, as I didn't have a small quantity on hand. I tasted the custard while it was still warm, liquid and thick, it tasted amazing, like solidifying coconutty but cheesy cream. The next day, I was gratified to see that the custard had set and the darkish vanilla bean colour had disappated into the custard. Now, it tasted like solid coconut cream- still amazing. I would definitely add the white chocolate, I believe it would have added a sweet depth to the frosting, lovely as it already was without it. Onward to make the cake, which was a cinch and which came out well-risen and perfectly shaped. This cake does peak but it is really easy to slice up for layers, my only disappointment with it is that it is a little dry and it does not taste of coconut, despite the addition of coconut milk. I wished I had put in shredded coconut too because it looked and tasted pretty much like yellow cake. I whipped some cream and mixed it into the coconut custard, now, it was really heavenly. Light and cheesy all at the same time, even our helper, who is as picky as orthodox kosher, cleaned out the bottem of the mixing bowl and declared it "mmmm, very nice!" The only problem with the frosting is that as stated in the recipe, it's not as stiff as buttercream and doesn't really hold it's shape. It can be used to stick the shredded coconut to the exterior of the cake but it doesn't really dry nor spread thick. If you want to stack layers, you should try to work in an air-conditioned space and adhere two layers at a time with just a thin layer of icing, then refrigerate the cake, to allow the frosting to harden slightly. Even then, given that I had four layers, the cake was not the most structurally sound and threatened to slide off its axis as I stacked and the frosting melted. I think if I made this frosting again, I would use a denser, more moist yellow cake or even a sugee cake, for better crumb and texture. Or, I would use this cake recipe and frost it with some of that coconut custard mixed into buttercream, so that the outer layer could be piped and decorated. Most importantly, I'd probably next attempt this cake when I had a big occasion for a four layered cake! It was so tall and pretty but most people, I've discovered, are entirely intimidated by a slice of four-layered cake unless it is a wafer-thin slice, so although it was all eaten up in the end, the frosting does only keep for three days and a cake this size would probably have been better received tarted up for a birthday party. I'll admit that I am not the biggest fan of either chiffon cakes nor pandan chiffon cake. Growing up, it was always a rather cheap, artificial dessert, sold in the school canteen and the bright green colours repealed me. That, however, is not the case with this pandan chiffon cake, which is a wholly luxe, modern take on the traditional classic. This pandan chiffon cake really celebrates the tropics that we live in, it is made with fresh coconut milk, hand-squeezed out of a shredded coconut and real pandan (screwpine) essence, distilled from blended pandan leaves and flecked with vanilla bean. The heady aroma of the coconut and pandan baking in the oven and cooling on the countertop, is the stuff of legend. I was given this recipe by my friend J. and after my initial failed attempt, she graciously allowed me to observe her at work on sunny Sunday. We made two cakes for family lunch on Sunday and they were all gone- this cake is so good that it's immediately become a family favourite! Here are the steps, one of which needs to be done the day before. Try to follow them faithfully and get the correct raw ingredients, it is so very worth it. (1) Crush a handful (I like to use at least 4 stalks) of pandan leaves and blend them in a blender with a small amount (just enough to liquify pandan leaves) of water. Make sure the pandan is well and finely-blended. Leave the liquid in the fridge to stand overnight and then discard the water that rises to the surface. The thick, green essence that sinks to the bottem is the pandan juice. (2) Buy fresh grated coconut from the wet market (300ml is about 1 coconut's worth of milk) and squeeze the fresh coconut milk from the shaved coconut. The remaining coconut pulp can be used to make dessicated coconut for other desserts or as plant fertilizer. Add the pandan juice to the coconut milk and add the pandan essence. If you use more pandan juice, you can forego the essence. We did this for the cakes shown here and they still turned out very green and flavourful. (4) In a separate bowl, add sugar to the egg yolks and whisk. Add Coconut milk and pandan extract mixture. (5)Fold in cake flour, baking powder and salt. Fold the egg white mixture into the egg yolk mixture gently, without breaking out the air bubbles and pour into mold. I would use a bundt pan so that the chiffon rises and bakes evenly. The pan does not have to be greased or paper-ed but you will have to cut the cake out of the pan. (6) Bake in the oven at 160C for 35 mins. J. has found that baking the cakes at a higher temperature of 180C results in a better crumb and nice brown crust. People always react with surprise, and sometimes a little consternation, on discovering that Japanese is my least favourite cuisine. In many minds, Japanese food is the embodiment of the heart and soul of food: fresh, fatty slices of otoro gleaming on shiso leaves, skilful chefs rolling up tubes of sushi in an assembly line so precise it takes a novice ten years to work his way up the various ranks, hungry diners slurping up steaming bowls of silky ramen noodles, and the onomatopoeic shabu shabu of ladles sloshing through flavourful steamboat broth. I think part of the problem has been the fact that I don't like raw food (man invented fire for a reason), and the fact that Japanese food's very simplicity sometimes works against it: in my younger days I gravitated towards technically complex, well-executed dishes with lots of bells and whistles. That aspect of my bias has receded with age, only to be replaced with another: Japanese food (at least good Japanese food) is too expensive. The corollary of that seems to be that if a Japanese restaurant is not prohibitively expensive, chances are it's not very good (and/or that even mediocre Japanese restaurants are very expensive). Which proved to be the case with En Japanese Dining Bar in Bukit Timah. En Dining has been around for a while: it's flagship restaurant is located at Mohd Sultan Road, and it has done well enough for itself to open another branch at Crown Centre, serving a wide array of food, from shabu shabu to sashimi to yakitori. The salmon sashimi, for some reason, was not uniformly coloured, which troubled me slightly, but the flesh of the fish was smooth and creamy, so there was nothing untoward there. The wafu steak was exceedingly disappointing: it was cut up into little cubes, making the meat lose whatever tenderness it might otherwise have had, and accompanied by deep roasted slices of garlic but precious little else. The concept of a wafu steak, as I understand it, is that the Japanese have taken a quintessential American comfort food and reinvented it, as they have with much of American heavy industry or manufacturing. I would expect, therefore, a lovely piece of Kobe beef that's been seasoned with rice wine and shoyu, and cooked with the sort of perfection that only the Japanese seem capable of. En Dining's wafu steak was a pitifully far cry from that expectation. Skewers of enoki mushrooms wrapped with bacon are fairly de rigueur in yakitori restaurants, and these were fairly tasty, if rather greasy. One of my preferred kinds of sushi is spider crab (te)maki, and while I found the seaweed wrapping to be too unyielding - I had some trouble biting through it and getting to the rice and deep-fried crab below - the rest of the sushi was enjoyable, though perhaps in future I'll order the maki rather than the uncut temaki. The crispy fried shrimp are as addictive as crisps; once you pop you can't stop... unless that is you pierce your gums against one of the prawns' sharp spines or shell segments, which I did. The chicken yakitori is delectable, glazed and caramelised with a sweet, umami sauce that makes the chicken cubes come alive in your mouth. I quite like unagi: it's got a sweet, nutty flavour that is unique among seafood, and apart from Japanese restaurants, it's rare to see eel on the menu. Unfortunately, I thought the seaweed that was meant to wrap the sushi was much too short for its purpose, which resulted in the sushi coming apart when I tried to grip it with my chopsticks, making for rather messy eating. We ended the meal with a bowl of Okinawan soba, which was served with a very light broth, and a generous helping of vegetables like grated daikon, seaweed, and what may have been kelp. A pleasant carbohydrate course that also helped to wash down the sticky Japanese rice. Overall, I was not greatly impressed with En Dining. The food quality is somewhat patchy, with some dishes being obviously more outstanding than others, and the variety on offer was also nothing to write home about. Service was pleasant enough, but that on its own is probably sufficient to make me return. We are in the processing of reviewing and contacting giveaway winners, so please leave us your contact details, it would be sad to miss out just because we can't call you back. As a sweetener, here are three additional items! The first is three tea tins of flower tea, from a boutique tea house in Beijing. These teas are each bulbs of Chinese tea that open into gorgeous pink lotus flowers or white jasmine flowers, they are really beautiful in glass or ceramic tea cups and perfect for tea parties or tea appreciation, for Chinese New Year or Grandma's birthday. 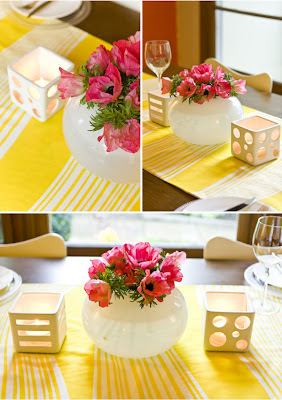 The second are festive yellow table runners. These table runners are each 2.7m in length by 45cm in width and beautifully finished with hemmed edges and a tapered ends. There are two patterns for these runners, one is a solid mustard yellow colour and the other is a fairly thin chrome yellow and white striped pattern, reminiscent of linen Ralph Polo Lauren shirts. Again, the picture is an approximation as the first runner pictured mixes both patterns together. The yellow of the runners is slightly darker than what is pictured here, they are pure cotten and give a real pop of colour to your table. They are made to go over the edges of a large round or rectangular table and are perfect for parties or even a small, colour-coordinated wedding. We have 10 of each to give away, so please state how many you are interested in. The second item is a set of three wrought iron candlebras, this picture is an approximation but they are fairly close. The three candle holders are lofted at different heights and have a single stem each with a fluted pattern only at the base (rather than all the way up as shown in this picture). They are made for table-top use and are a lovely accent for festive dinners. Leave us a comment or contact weyzhan@gmail.com with how to reach you if you would like to win these items and as usual, the receipient is responsible for picking them up. Curiously, despite the fact that the Tung Lok Group has been around for quite some time, I don't seem to have reviewed very many of their restaurants. Thankfully, that is beginning to change, beginning with the rather epic meal at Chinois. So it came to be that a table of ten gathered to celebrate a birthday dinner at Tung Lok Classics in Orchard Parade Hotel. First impressions were marred by the difficulty of negotiating the cramped carpark, as well as the challenge of actually locating the restaurant itself, but the rest of the dinner was truly memorable. Although Tung Lok Classics looks like any ordinary Chinese restaurant, I was greatly impressed by the level of service, which was both friendly and professional (although to be fair we did book a private room), as well as the quality of the food, which was of a consistently high standard. We started with a duo of prawns cooked in two ways: lightly fried and coated with wasabi mayonnaise, as well as deep-fried with salted egg yolk on Chinese lettuce. Wasabi prawns are done to death these days, but these not slathered with the stuff, and so they were slightly heady without being cloying, while the deep-fried prawns were richer and tastier thanks to the egg yolks. In the middle of the prawns was a scoop of watermelon, which had been excavated and filled with diced mango - a fruity and juicy intermezzo to refresh the palate in between the two prawns. The soup course featured a double-boiled pork soup that was liberally seasoned with wolfberries, resulting in a deeply intense consomme that was also pleasantly sweet and invigorating, notwithstanding its heat. The steamed soon hock with minced garlic was a behemoth, but very fine: the flesh of the fish was exquisitely delicate, and its natural sweetness was enhanced by the slightly more robust notes of the garlic. I've often wondered why only Asians discovered the beauty of eating fish that has been simply steamed with some soy sauce, vinegar, Chinese wine and spring onions - the natural taste of fresh fish is infinitely preferable to grilling or frying. Some of the food at Tung Lok Classics borders on the tonic: such as the boneless chicken braised with shiitake mushrooms, red dates, ginger and spring onions. Juicy and tender, the chicken was brimming with the succulent savouriness of the mushrooms, and the mild saltiness of the light sauce. I don't know how to explain it, but eating this just makes you feel healthy, and unlike some Chinese herbal foods, the dishes at Tung Lok Classics do not taste fustian or unpleasant: quite the opposite, in fact. This beautiful dish resembles an enormous pearl, but the lustrous cabbage leaves in reality conceal a ball of mushrooms and water chestnuts, which, when freed from its nacreous shell, and paired with the verdant broccoli, created a sensational array of colours, tastes and textures. The noodle course was fairly unusual: fried Japanese noodles with snow peas and prawns, resembling an Oriental pizza, over which a thick, hot, luscious broth was poured, softening the noodles and serving as a sort of soup/sauce. I have to admit I didn't really enjoy this, not least because by this time I was rather full, but also because the noodles were still semi-hard and crispy (rather like uncooked instant noodles), while at the same time they were not dry. I suppose when it comes to noodles my palate is still somewhat conservative: they should either be wet or dry, but not something in between. Where the restaurant truly excels is in its presentation of its desserts. The birthday cake was ours and the sesame balls were theirs, but the real star is the handwritten Chinese calligraphy in squid ink, with a personalised birthday poem from the restaurant staff. As if that wasn't awesome enough, they even gather round to sing you a birthday song (in two languages), and clap their hands while the head waitress reads out the poem in a sonorous cadenza. Now that is service. After that performance, the fruit platter isn't quite as impressive, but it is still quite a sight, the fruits nestling on a bed of ice, in which boiler tubes have been thrust, containing a chilled, vividly purple liquid which turns out to be a remarkably refreshing drink of kiwi and mango juice, with what appears to be some beet juice for colour. Finally, we round off with an unusual dessert of avocado jelly (more like a mousse, really) with soya bean cream. I'm not really a fan of either avocado or soya bean, but the other members of my family are, and they seemed to enjoy it greatly. I suppose it's a healthy alternative, as it offers all the creamy richness of traditional puddings, but without too much of the sugar. Despite this being my maiden visit, I was suitably impressed with what Tung Lok Classics had to offer. The food was at turns excellent and inventive, while the service was uniformly warm and engaging. At the end of the meal, you're even given a Tung Lok Membership (depending on how much you spend), granting you a discount off future meals in order to entice you to return. It wouldn't surprise me if we returned even without the membership.